The uptake of Building Information Modeling (BIM) applications by the Architecture, Engineering and Construction (AEC) industry has snowballed in recent years. BIM applications enable the creation and use of an intelligent data model that is shared and used in different phases of a building’s life-cycle. These applications are quite complex and provide much greater functionality than earlier CAD tools. This makes it hard to gain proficiency in effectively working with BIM. The lack of personnel is in fact one of the major barriers to further BIM adoption. As a response to that, training organizations are offering relevant learning contents and accompanying methodologies in a BIM training kit. Jingjie Huang, one of our graduate students, conducted a systematic analysis and comparison of state-of-the-art BIM training kits (focusing on Revit Architecture) and formulated guidelines for developing new ones. In this post, I discuss some of her findings. 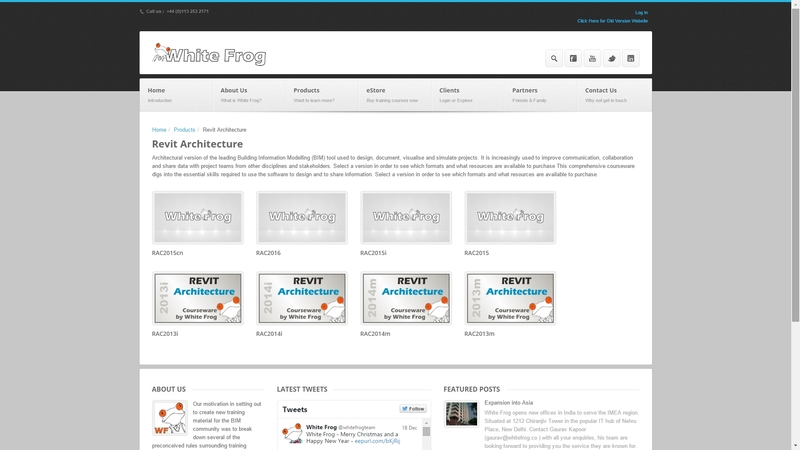 The first BIM training kit studied is from White Frog, a professional training organization from the United Kingdom. This training kit offers licenses for instructional resources to students and trainers, with the emphasis on the latter. One of its main instructional resources is an animated eBook with instructions, trainer’s notes, images and screenshots. Some of the images are dynamic and shown in a new window after clicking, for example to explain the differences between the view styles ‘shaded’ and ‘hidden line’. Another important resource is the eTeach File Store that contains start and finish files of practical exercises. Tutorial videos of 3 to 5 minutes are offered to explain some more difficult concepts. All information is presented as self-contained units that allow just-in-time training, providing the right amount of information needed for a specific task. The second training kit studied is BIMtopia, a training platform created by an instructor from Stanford University. 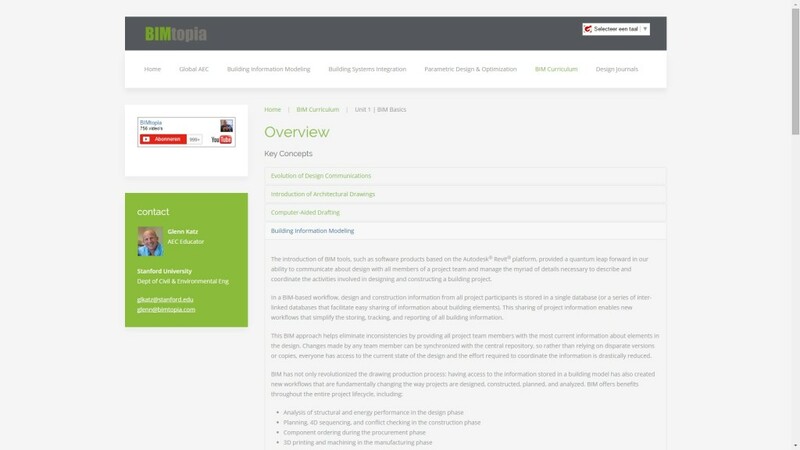 BIMtopia provides (free) BIM training in a more traditional way, with presentations and lectures. 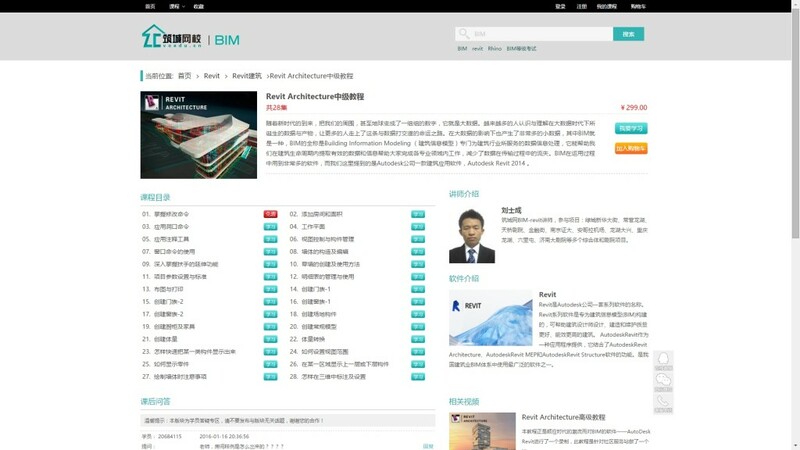 The most important instructional resources are the BIM curriculum, which includes tutorial videos, exercises and written instructions, and Massive Open Online Courses (MOOCs) that deal with a broad range of fundamental and more advanced BIM topics, tools and techniques. At the moment, there are three MOOCs available (Building Information Workshop 1 and 2, and Parametric Design and Optimization). The university lectures of the MOOCs need to be followed in order. From all BIM training kits, this one requires the highest level of complex thinking. The third training kit studied is Autodesk Education Community, a platform by Autodesk (the software vendor of among others Revit Architecture) that provides free learning and support. 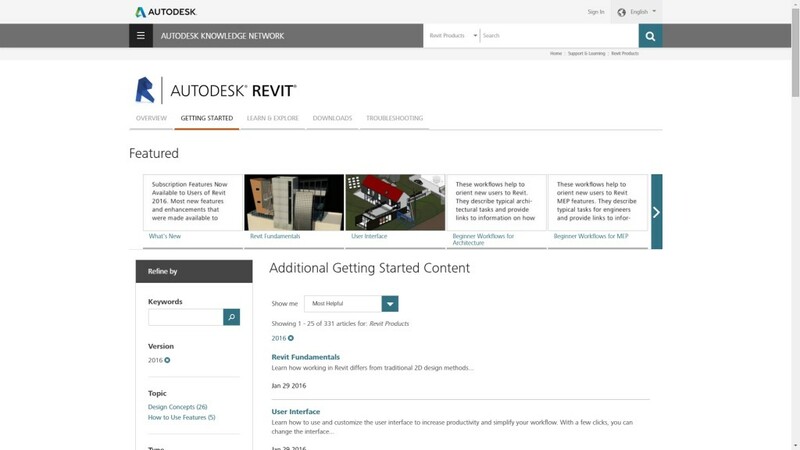 Although a large part of the instructional resources of this training kit are provided by employees of Autodesk itself, users can also upload resources. 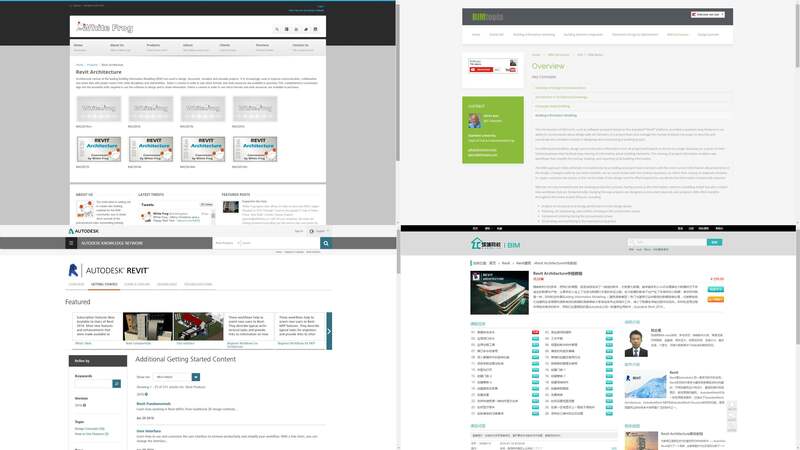 As such, the ‘learn by product’ section refers to tutorial videos and instructional texts of major BIM topics like how to use family elements in a model. The quality of the videos is rated highest, particularly because techniques are used to direct the attention of users (such as a voice-over, highlighting buttons clicked on and zooming in and out). The distinct trainings can be followed independently (just-in-time), although it is sometimes hard to find the right tutorial video – the main instructional resource – among the large number of videos. The fourth training kit studied is from BIM.voedu.cn, a professional organization that provides BIM software application skill trainings, accreditation and enterprise trainings specifically for the Chinese AEC industry. Most training courses need to be purchased, but free trials are available. All resources are in Chinese only. The training kit offers software trainings at three levels: beginner, intermediate and advanced. Tutorial videos are again the main instructional resource and these apply similar techniques to attract attention as the third training kit; no exercises are provided. A specific part of the training kit offers examination material that is required to get an accredited degree as BIM modeler, advanced BIM modeler or BIM application designer. Not all resources are up-to-date: trainings dealt – at the time of the study – with the 2014 (instead of 2015) version of Revit Architecture. These trainings need to be followed in order. BIM training kits need to offer clear and complete modules that support and supplement each other. Training kits must provide realistic field-based problem-settings for the learners. Training kits need to provide opportunities to practice with the learning contents. Attention guiding techniques are encouraged to attract learners’ attention. Tutorial videos are powerful if a recorded demonstration is combined with a voice-over that directs a learner’s attention to software elements.